I’m just going to keep writing about all the things that fire me up about houses, ok? Because this is my blog and I can rage if I want to. Ok I’m not really upset by it….just really passionate. Let’s say that. Day 11 is about that missing thing in homes. That thing that people don’t have because they are afraid of it dying. When I look into a room and something feels a little off, it’s usually because there is a lack of life in it. A real live thing, I mean. PLANTS. I’m not suggesting you become a plant lady/man. But, if it feels a little sterile in your home without a little life other than your slobbering dog, then time to bring in some plants. Here is where all of the people who kill plants complain, “But it’s just going to die!” and you may be right. But, what’s the harm in that? So do flowers but we still buy those at times for a little pick me up….if just for a week or so. A few dollars it will cost you. That’s the worst that can happen. Then you chuck it and try again. HOWEVER, I’m here to help you be a little more successful. If you’re a pro at this already then carry on about your business or add another plant. If you’re not, then read below about how to get just ONE plant to live under your care. I have these outside in pots at my house. I live in the desert with extreme temps. They survived through not enough watering in 120 degree summer heat…in a pot. I don’t know how. They are also good inside plants because they are natural air purifiers. They have a cool shape, too so winning all around. I expect this snake plant to do pretty well here at my Rattan Ranch Airbnb despite it not getting watered very often. I love these plants because they just love to grow and climb and have a mind of their own. I had this pothos in my house, but took it to The Shack to give the house some life. I’ve been very careful what plants go into my Airbnbs because ain’t nobody watering those unless one of my cleaning people get a wild hair. This one has not only survived, it’s thrived! It loves it here in this bathroom with all of that light by the tub. When I took it over there 4 months ago, the longest “tail” on it was not long enough to touch the tub yet. Now look at it. In my experience, the pothos needs a cup of water ever week but maybe in this situation it’s thriving off of steamy showers and baths. Who knows. When the tail gets a little too cray cray, you can give it something to follow like a string or simply give it a hook to hang from. I bought this tree at Home Depot about 2.5 years ago. It was half as tall. This photo was taken about 6 months ago. It is just about to touch the ceiling now. I’ll let it. I think that is badass. People say this tree is difficult to care for but I don’t find that to be the case. It’s in the middle of the room (the kitchen is to the left), but it gets sunlight from four glass patio doors to the right. Those curtains are ALWAYS open during the day - REFER TO YESTERDAY’S WINDOW CHALLENGE ON HOW TO LET LIGHT IN SO YOU CAN LIVE LIKE A HUMAN, NOT A HERMIT. If you don’t open your curtains, yes your plants will die. Simple logic. For any of the fiddle leafs I have, my watering schedule is this: when I have a bit of drinking water left over in my glass, I pitch it in. Seems to like that schedule. These little mofos are more interesting than expected. One good thing about cactus is that they can pretty much take the worst beating and still continue on in life. I once asked a cactus nursery owner what I should do about a cactus I have that is outside and dying, he said, “Well, it’s 120 degrees out and it’s getting a little scorched. It’ll be fine. It’ll grow a callus of sorts and then carry on stronger than ever because of it.” And sure enough that little mofo sprouted a baby. So, yeah I don’t get it. My cactus that are inside need watering about once a month but not much. They also need sun, so somewhere near a window. See the little planter with two cactus in the photo above. Those cactus were in my Larkspur flip and never got watered. Then I brought them home (see them in the photo with the fiddle leaf), watered them once a month. Then I took them to The Shack. Very little watering there. Still going strong. These are supposed to be so easy, but I found them to be tricky until I learned a thing or two. The petal thingies would always fall off by the masses and I couldn’t figure out why. It’s because I was watering them too often. They too like very little water. And whatever you do, don’t water into the floret. They hate that apparently. If you water them too often, they turn translucent-ish because they are drowning. I also had the problem where they start getting real leggy where the stem is growing long and the petal thingies (I don’t know the real names, leaves? whatever) start to get small and spaced out. That is a telltale sign that they aren’t getting enough light. Move them to a window ledge or hang them in front of one. This brings me to this month’s book club book because whatever plant you choose, you’re going to want to know what to do with it if you don’t want to murder it. Don’t just wing it. Learn about it. Succeed. Then, try a new one. I find if I binge shop on plants and just wing it they just die. If I bring in a new one, one at a time and learn its intricacies, then I .am more successful. This month’s Design Book Club book is Urban Jungle: Living and Styling with Plants by Igor Josifovic and Judith de Graaff. Talk about a beautiful and super helpful book. This book gave me that AH-HAH moment with the succulents and helped reverse all the murdering I was doing. Add to that the countless beautiful and genius ways they display their plants and I was totally sold on becoming a total plant lady. Try this book out to help you stop murdering all your plant life. 1. Can’t Give It Enough Attention: Some plants have awesome shapes and color but are too much work to keep around in a live version. For instance, I have a faux banana tree from Target in my Rattan Ranch Airbnb. I know that a real one may not be in the cards for a vacation home because it just won’t get watered enough. It still makes the space feel alive, despite that fact that it isn’t. I still add real plants, like the pothos up on the kitchen shelf to balance out the real to fake ratio. Side note: this fiddle leaf is a good looking fake version. 2. Not enough light: Some places aren’t going to get enough light no matter what. 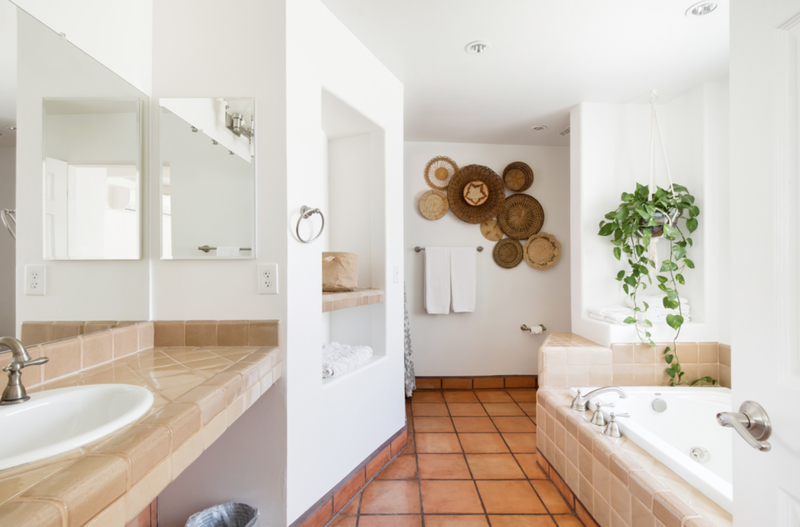 For instance, this bathroom in The Rattan Ranch Airbnb doesn’t have a window at all. Ain’t nothing going to grow in there. I put this faux Target plant in there to brighten the place up. I can’t for the life of me find a link to this plant, but Target has all the good looking faux plants right now. Get after it. 3. Safety: If you have little ones in your home, whether in canine or human form, you may not want a real cactus stabbing them. Opt for a faux version. This one at Target is good looking. It’s time to go get started. Go bring life into your house. Or at least the illusion of life. Show me the results by tagging #updatedontrenovatechallenge! All of the challenges can be found here. Wanna stay at one of my Airbnbs while you’re in Phoenix or Cincinnati? Check out the options by clicking here.